Residents of Toledo OH find regular roof inspections helpful in detecting leaks early. The National Roofing Contractors Association recommends that property owners seek professional roof contractors every other spring as a form of preventative maintenance. One sure indication that a problem exists involves gaping openings in the roof’s surface. People often think of holes in a roof as large and immediately apparent. Although falling objects, such as tree branches, sometimes do create big tears, small perforations can allow rainwater and dampness to enter the house, also. If you notice a pinpoint hole forming in the attic ceiling, then taking rapid action to correct the leak may prevent further damage. Many experts recommend examining the attic on a sunny day to see whether visible rays of sunlight enter the premises. Another potential sign of roof leakage concerns ceiling stains. If residents notice these occurring, then calling a professional roofer remains a wise idea. Sometimes homeowners move into a home and discover preexisting discolorations on the ceiling. These splotches may (or may not) indicate a current leak; often earlier occupants repaired the roof but simply failed to repaint. Asking a trained inspector or roofer to investigate the issue may bring peace of mind. 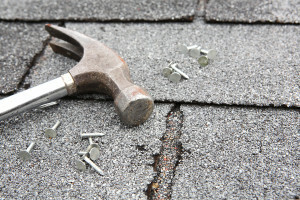 If a property owner with an asphalt or metal shingled roof discovers shingles or displaced roofing nails in the yard following a storm, requesting a roof inspection may prove timely. The absence of a single tile might not create a visible leak inside the house, but it does signify a potential problem because at least one spot on the roof receives reduced protection. Prompt roof repair in this situation may prevent deterioration of the exterior and the development of a hole. In Toledo OH, professional roofers will respond rapidly to requests for assistance. A stained wall should also arouse suspicion that a potential leak exists somewhere. Water does not always fall directly from a hole in the roof; sometimes droplets travel through circuitous routes, along beams or rafters, only to collect inside a wall. A wall stain does not mean a current leak exists, yet it may provide strong evidence of a problem. At the very least, this issues warrants a closer examination by a professional. Some professional roofers warn that fascia surrounding chimney pipes, vents and skylights sometimes causes particular concern. Moisture occasionally leaks inside around poorly secured fascia, entering the house through very narrow gaps where builders inserted fixtures through the roof. In the case of a skylight, for example, discolored markings around the insertion area should raise homeowner suspicion about a potential leak. Professional roof repairs can assist homeowners in better securing these sometimes troublesome problem areas. Calling a roofing company promptly if you suspect a leak helps prevent more extensive repairs later.